The premiere of Hamilton in Puerto Rico started with a standing ovation and ended with a teary-eyed Lin-Manuel Miranda. New York Times senior editor Charo Henríquez explains how the power of art has been a lifeline to many Puerto Ricans affected by the devastation of Hurricane María. 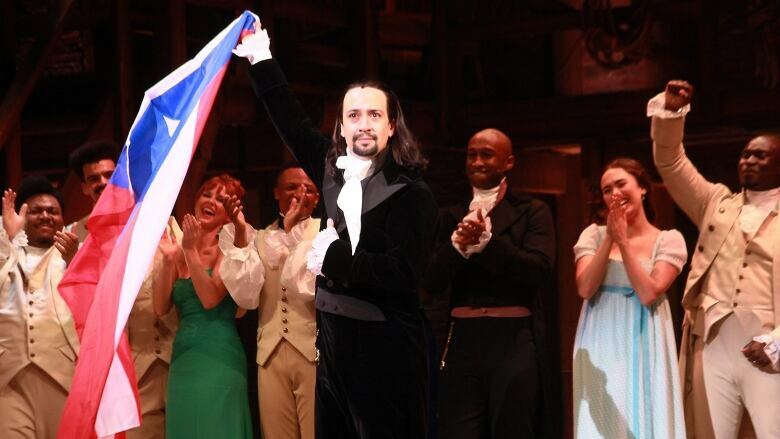 The hit Broadway musical Hamilton is currently playing a three-week run in the city of San Juan, Puerto Rico. It's a significant event for Puerto Ricans who are still reeling from the effects of Hurricane María, which struck the island back in 2017. It's also a big deal for the show's creator and star, Lin-Manuel Miranda, who was born and raised in New York City, but spent a considerable amount of time in Puerto Rico when he was growing up. The premiere of Hamilton in Puerto Rico started with a standing ovation and ended with a teary-eyed Miranda. The proceeds from the musical's three-week run are going to a fund his family started that's helping artists recover from the hurricane. Charo Henríquez is a senior editor at The New York Times. She just got back from a trip to Puerto Rico where she covered the opening night of of Hamilton. Henríquez joins Tom Power live from New York to explain how the power of art has been a lifeline to many Puerto Ricans affected by the devastation of Hurricane María.